(WASHINGTON) — Havana Chapman-Edwards, a young activist and avid book enthusiast, has been determined to change the world since birth, says her mom Bethany Edwards. Of course that’s only seven years. So when Chapman-Edwards teamed up with friend Mari Copeny, 11, to honor Kwanzaa’s principle of ujamaa, the concept of building community businesses, they decided to raise money to donate books for children in Flint, Michigan, and her hometown of Washington, D.C.
Edwards and her husband are diplomats, and they have traveled to five countries with their daughter. Chapman-Edwards is fluent in English, Latvian and French, and sponsors book clubs in the U.S. and Ghana. She’s raised nearly $40,000 to donate children’s books around the world. Chapman-Edwards gained national attention in April 2018 when she was the sole participant in National School Walkout Day at her elementary school. Since then, she has done a weekly story hour for kids. “Havana was our story time leader this summer,” said Ramunda Young, owner of local southeast Washington bookstore, MahoganyBooks. But it was the attention of one very famous dancer that had the young activist blown away. Chapman-Edwards and Copeny raised $6,000 to see “The Nutcracker” with other school-aged children and planned to give away copies of ballet dancer Misty Copeland’s book at MahoganyBooks. It was there that the girls got an amazing surprise: a video message from Copeland. “I’m just so honored and wish I could be there to celebrate with you guys at MahoganyBooks but I’m getting ready to perform in ‘The Nutcracker,’” Copeland, who was performing in a show in California, said in the video. “It means so much to our communities and young people that can look at you guys as leaders. “You’re doing such a great job, thank you for taking a stand for what you guys believe in and making books available to the youth in our communities; it’s so important,” she added. Copeland, 36, is the first African-American woman to be principal dancer in the history of the American Ballet Theatre. 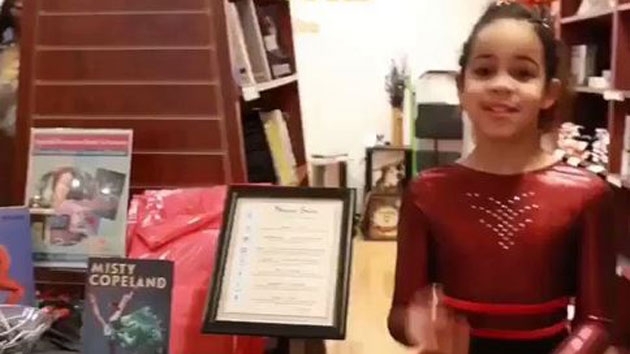 “Havana wanted all the kids to walk in the bookstore and be given a book with a girl that was full of #blackgirlballerinamagic,” Edwards told ABC News in an email. Chapman-Edwards’ fundraising rolls on, though. For her eighth birthday this Saturday, Chapman-Edwards is trying to raise $8,000 to donate more books to schoolgirls at St. Bakhita Orphanage in Ghana.